I’d like to thank you, Rachael, for all your posts (not only this one: the most recent) – they are excellent in every way, and have been a great boon to me in moments when I have felt too exhausted to create my own materials. I really appreciate your generosity in sharing your work, and producing it in such a clear and attractive way that I can walk straight into a group and know that they will be motivated, engaged and learn a lot with hardly any preparation from me! I work with adults in Spain (most of them teachers themselves) and their feedback has been positive – I’d like to pass this on to you with many thanks. Thank you so much for that. It’s really lovely to hear that you’ve been enjoying using the materials (and that your students have too). 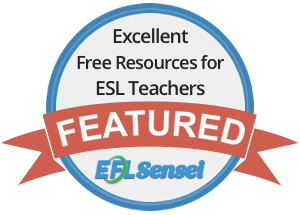 Fantastic resources for ELT classes: imaginative and motivating, students adhered to the tasks very well, fully understood the activities planned, and enjoyed viewing and sharing their own ideas – after personalising it and presenting their own plans. That sounds like a great class. Glad it went so well, and thank you! Thanks for sharing, really helpful!